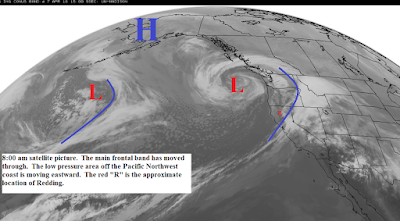 The main frontal band moved across Northern California during the night. This morning's satellite picture (below) shows the low pressure area is off the Pacific Northwest coast and is moving eastward. Partly cloudy skies today with scattered showers. Snow levels will stay 6000 feet or higher. For the next week we will be under a weather pattern like the one shown on the map below. Low pressure troughs and frontal systems will move across the north state every couple of days. These will be fast moving systems but will bring rain to all areas. Sunday we will have mostly sunny skies. Late Monday and Tuesday a trough will bring rain to the area with snow levels 6000 feet or higher. The next system will be late Wednesday and Thursday with more rain with snow levels down to about 5000 feet. Next storm in the series will be next Saturday and Sunday. Days between the storms will be partly to mostly sunny with near normal temperatures. The longer range models show this weather pattern continuing for the next 10 to 14 days.